This weekend just gone I decided to take a little mooch around my local Superdrug as they currently have 20% student discount with Unidays, and as I needed a few bits I thought i’d take full advantage. Now I wasn’t going to post a haul, but it got me thinking back to old blogging days and how much I used to love posting little hauls like this one, so I thought why not?! 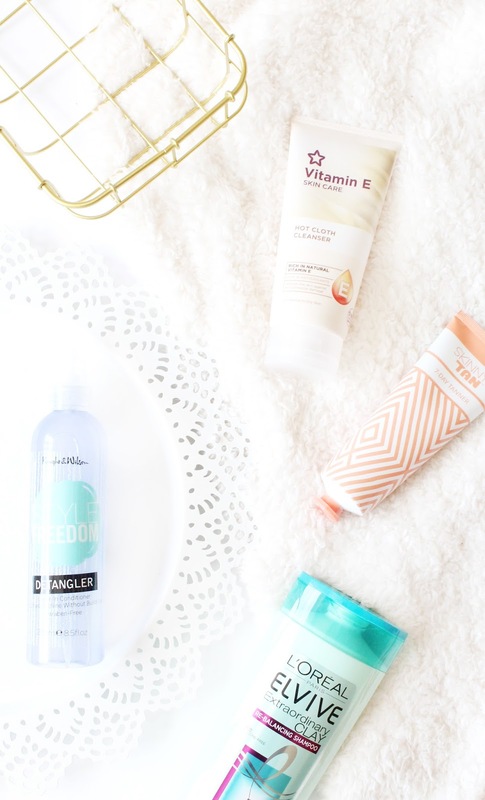 When it comes to purchasing beauty products I rarely ever go in Superdrug anymore, why I don’t know as they have some amazing own brand products that i’ve heard so much about but I haven’t had a proper mooch around a drugstore in quite some time. With that being said and with the student discount offer fully egging me on I picked up a few things I was in need of, whilst also a couple of new products to try out. Starting off with a few bits that I knew I needed as I was running out of shampoo, so I thought i’d stock up on my favourite L’oreal shampoos as it’s been some time since I last used them and my hair was starting to get used to the one I was currently used. A favourite of mine is their Extraordinary Clay Rebalancing Shampoo (£2.89) as it really works to combat my hair looking greasy come the second day and also works to remove any build up that I have in my hair. I tend to use this on rotation with their Extraordinary Oil Nourishing Shampoo (£4.49) as this also works to nourish my hair and to make my hair appear less damaged than what it actually is. Safe to say i’m really happy to have these two shampoos back in my hair care routine, as my hair is loving them. Another haircare product I decided to pick up was the Style Freedom Detangler (£7.99) as my hair can get really knotty, especially when I curl it so I decided to get myself a detangler to help as I don’t like to further damage my hair by yanking a brush through it, so i’m hoping this helps to soften and untangle my hair making it easier to brush. This seemed to be a newer brand to Superdrug, and if this product impresses me I will definitely be going back to check out more from this brand. The main reason that I popped into Superdrug was because I was in desperate need for a creamy cleanser, and unfortunately they didn’t have the one I wanted but i’d heard some amazing things about their Vitamin E Hot Cloth Cleanser (£4.99) so I thought i’d give that a go. So far I absolutely love this, more than the cleanser I was going to purchase as it leaves my skin feeling absolutely amazing and so soft. Finally whilst making my way to the check out I spotted that they were stocking Skinnytan, which I tried out around two years ago and absolutely loved it so I thought i’d pick up their 7 Day Tanner (£19.99) so I could give it a go when the weather is a little warmer. So that is everything I picked up from Superdrug, and I saved almost £15 on everything I purchased so I was really happy with that! I’m not sure when the student discount ends, but I’d definitely recommend checking out your local store sooner rather than later. Have you picked up any new beauty bits recently?